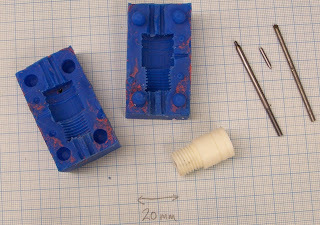 The valve mechanism in the experimental paste extruder was a bit difficult to make as it needed some machining. I've now done an alternative that uses rapid prototyping to make a blank and then soft casting in a silicone mould to produce the final item. You can't quite use rapid prototyping for the whole thing because RP is not good at threads, and this has an M14 one. The advantage of this approach is that once you have set it up you can make a lot of these devices quickly and easily by repeated casting. It uses the trick of trapping nuts in the resin to give good retention of screwed-in parts - see the soft casting page again for details. Those of us in the tweaking stage will appreciate the level of control needed over the position of the first layer. Here's a gizmo I made to get better control on the z flag using an M5 bolt. I've uploaded the part files onto the latest SVN release of the bot. - Important: First layer now prints @ z=0 i.e. home position (previously @ z=extrudate height). It's quicker and easier to tweak the nozzle to home position to the right height for the first layer, which was previously a bit of a hit and hope. Plus it's safer, at the home position the nozzle doesn't have to physically touch the bed, which it just about has to if first layer printing starts at z=extrudate height. 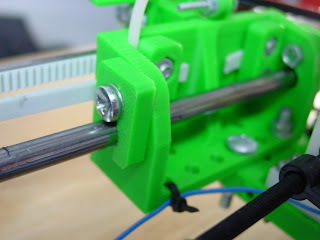 - Bruce's bug fix to stop extruding on dry segments! Hurrah! - Included commented code for horizontal and vertical hatch vectors. Our new Power and Communications board has now been fully tested and documented. It features many improvements, most notably diagnostic LED's for Tx and Rx (yay blinken lights!) It also has a better layout, more reasonable capacitors, and more power outputs. Check out the documentation (now with lots of pictures). We also have it fully stocked in the RRRF store. Thank you to everyone who helped out to make this happen. This is an excellent incremental improvment over our previous board and takes us one step closer to having an awesome robot that prints us out cool things. Keep up the good work guys! Right. How the *!*? am I going to get my shirts and this lot in my suitcase? Trying to nail the parameters on the Bath Darwin, I realised that the only factor I'm flying slightly blind on is the output of the extruder. Here's an output profile for Capa using a target temperature off 100 °C and a ø 0.4mm nozzle for a variety of motor speeds. I hit a technical problem back in September and you haven't heard much from me since then. I've been able to print in HDPE and am well on my way towards sorting out the problems with using brushed gearmotors to run both the extruder and the Cartesian positioning system of Tommelise. 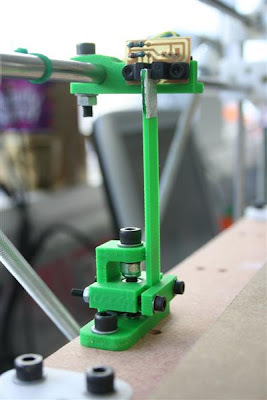 I'm publishing in the main blog rather than the builder's blog this time in that the issues that I am addressing impact on both Darwin and the various repstrap machines that are abuilding. As you are all aware by now, I am sure, HDPE and to a lesser extent CAPA tend to curl when extruded at ambient temperatures. This curling tends to happen at corners when the aspect ratio of the object being printed approaches 1. When you have long objects you tend to get curling in the plane of the longest dimension. Nophead published some really compelling photos of this effect over in the builders' blog last month. I got very discouraged about the warpage issue and resolved not to share my misery with the rest of you if and until I came up with a viable solution to the problem. I recently got a set of molds for the extruder from Adrian. After acquiring the proper casting goop, I decided to spend a day learning how to do it and see if its something I could do myself. Turns out, its really easy! casting a set of parts from beginning to end takes about 30 minutes, although 15 of those are waiting for it to cure. this is good for someone like me who multitasks alot. i'll setup the molds in the lab, cast them, and while they are curing, i'll work on something else. i plan on trying to make my own mold as well, because then i'll be able to double my production while only slightly increasing the time it takes. its pretty much just as easy to setup and pour 2 molds as it is to do 1 mold. 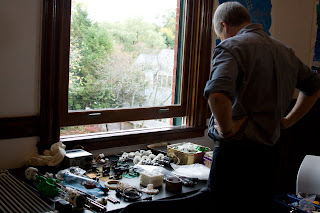 i have an old, non-straight extruder that i should be able to get a mold of, so eventually people will be able to choose between old and new if they want. 1. brass bearings. i dont have a supplier for these yet, but i do have an idea for how to make them rather easily from brass 10-24 nuts. i'll be trying it out this week, and if it works, then we'll be in business!! 3. get the final part list. i need to double check the part list in order to create the kits to sell on the store. this will also be helpful for people who want to order them directly from McMaster, etc. specifying the right nuts, bolts, washers, etc. will really help out alot. we're close to having extruders generally available! !